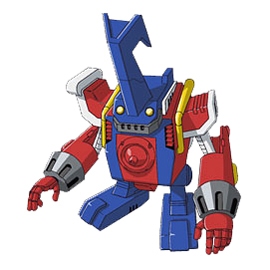 Ballistamon is a member of Xros Heart in Digimon Xros Wars, and later became the partner Digimon of Tsurugi Zenjirou in Digimon Xros Wars: The Young Hunters Who Leapt Through Time. Ballistamon is a member of Xros Heart, and Shoutmon's best friend, who lives in the Village of Smiles in Green Zone. He was created by Olegmon as Dark Volumon, however, during a fight against Shoutmon, he was hurt and, due to Shoutmon's repairs, he lost his memory, becoming Ballistamon. Ballistamon is a member of Xros Heart, and part of Kudou Taiki's Collection. He's sent to him, alongside the rest of Xros Heart's Digimon, by Wisemon early in the series. During the battle against the Vamdemon sent by Quartzmon, Ballistamon, alongside Revolmon, is given to Tsurugi Zenjirou to help fight against them. Ballistamon appears in the Super Digica Taisen card game.